1) The locusts came out just after of the opened bottomless pit (video below) !!! We reported in latest edition (you can watch it below) that the Door of The Hell was opening, and that the key of the Abyss was given to the fifth angel during the collapsing of the cliff of "Le Col-des-Roches", on October 3, 2017 to open the bottomless pit of the Abyss. We are now able to report that It was done ! But after that what is happened ? As described in The Word of God, The Holy-Bible, the locusts went out of the bottomless pit !!!!! Look at our latest new report if you not believe that ! Remain connected to EATVI / HGV, your new news channel, in live from the south tower of the swiss Twin Towers (The Hell's gate), to have further information ! This video clip show a mountain cliff collapsing in live in the au-schwitz hidden extermination camp. This apocalyptic event, happened in a very darkness ambiance in the valley of Le Locle in Switzerland, on the october 3, 2017, at 7.00 pm on the evening exactly. These images are exclusive and unpublished and were produced by EATVI/HGV, THE ETERNAL GOD ARMY TV in HAMON-GOG VALLEY. In this first edition, you will see unpublished and uncredible images of a collapsing cliff in the township of Le Locle, the first warning sign of the future and major disasters that will happen in all the Switzerland in a very close time. EATVI/HGV is serving THE TRUE HOLY GOD of ISRAEL, and then enjoy of the best and powerfully protection and all of other usefully supports. Located in a very higly and very Holy place, hidden for centuries by the more highly freemason satanic elite levels, EATVI/HGV will report you all the future but also some of major but for a long time hidden crimes that happened in this area and in his country. 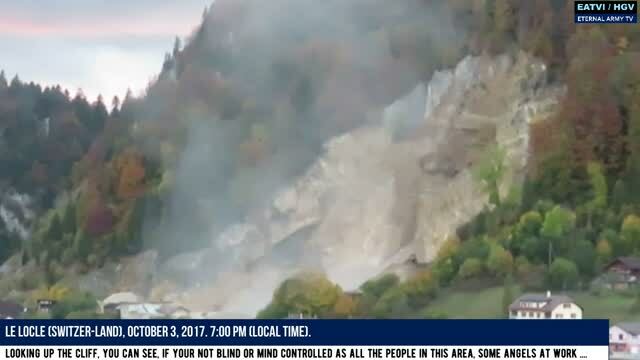 The collapse of this cliff, that happened on October 3, 2017, in 7:00 pm precise and looking at first as a so minor "natural" disaster is in fact a highly symbolic event and it was directly performed by the True God, His Eternal Army and Her angels legions. Furthermore, we can notice, that any emergency services, any police and any ambulance with the hooter bowling, like it usually happen here when they drive to drink the aperitive, or to catch some innocent witness to fight, to put them in psy asylum to be poisoned or in jail and to make them shut down to be unable to tell anything about the numerous of the swiss hidden federal crimes from the federal council, its banks and its NGOs. Most of them are stolen the more poor people, african and stranger one, and also its own swiss citizens, sometimes committing crimes on the swiss citizens children themself, or also as they did before against the jewish people too, they have sacrificed not long time ago. Just after the collapsing of this cliff, some "paranormal" activities was appeared in the sky, the darkness felt suddenly, in a very dark and apocalyptic ambiance. See you soon here for more unpublished images and news, hidden information, and some others secret historic facts, that can or have allowed to establish the peace and love for all the religions and all nations around the world, and that have maybe been able to contribute to make failed the anti-christ plan to destroy all the humanity. I hope sincerly that all the collabo people, they will recognize and know theirself, whom have saboted all our work we have done in these purposes, will be punished, and that they will enjoy their eternal painfull "holidays" in hell ! This video was produced by Tite servant (please, notice that the Tite servant youtube page is fully boycotted by youtube/google, our video being deleted and forbidden to be published, the number of views are decreasing with the time, etc...) with the precious help and support from his Lord and his Savior for ever, Jesus-Christ, still in live and alive in Hamon-Gog Valley for EATVI/HGV. The Eternal Army Intelligence Services just confirmed us the true location of the house of the Lord of the Darkness, also called the Devil Anti-christ. To confirm this information, the EAIS told us that it is in this small Swiss locality of the mountains Neuchâteloises that we also find the True Door of the Hell, as well The Satan's synagogue, that was put in place, in the goal to open the Hell's gate !!! This occult conspiracy, the Devil's House with the 2 Twin Towers (pilars), is "working", as told before, as a satanic temple to extract the demons from the Hell and was indeed elaborated by the freemasonics secret societies on a very old Holy Place. All that was also hidden for a long time by all the same secret societies, like the NWO's elite, as well the rosicrucians secret societies, the Vatican, and many more evil societies ! To know further secret informations about this gate, please watch our video in our Twin Peaks gate menu !